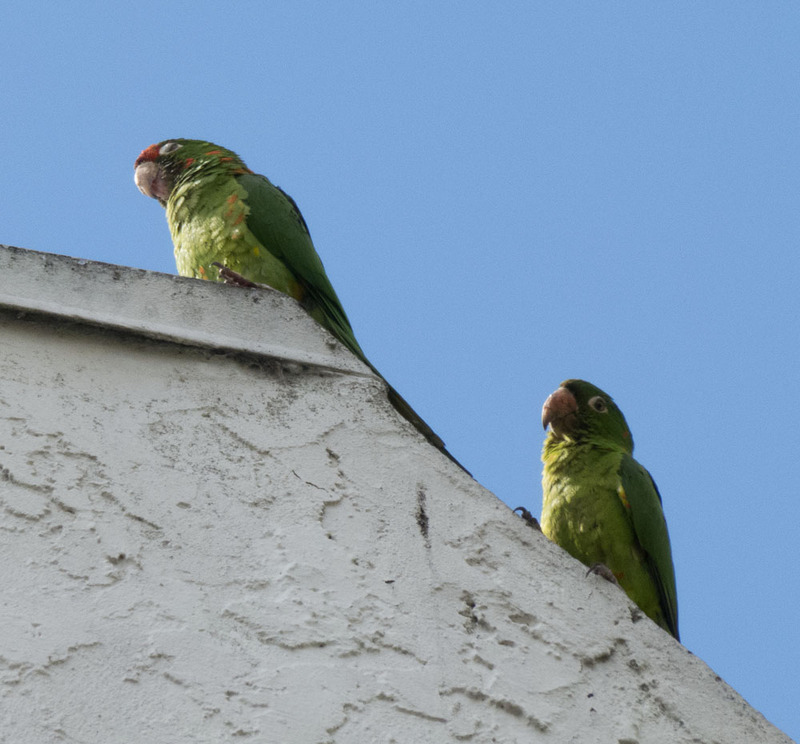 San Francisco has its famous wild parrots of Telegraph Hill. 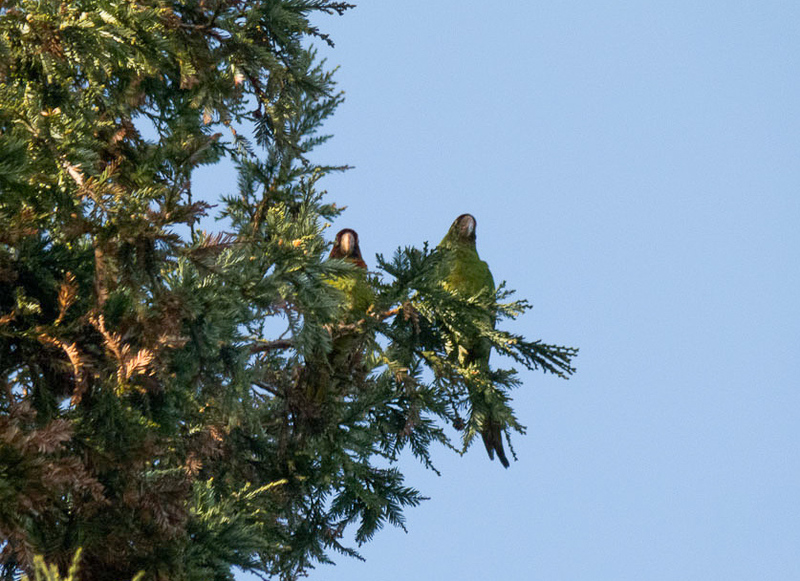 Just down the road however, about 60 miles, in the Silicon Valley community of Sunnyvale, another flock of parrots also lives and thrives out in the wild. Perhaps they don’t enjoy the same notoriety as their SF cousins, but they are just as regal and an odd and remarkable spectacle enjoyed by all those who see them. Known for some time by local residents, I ran across the parrots about 15 years ago, when I first moved to Sunnyvale. After leaving an Orchard Supply (OSH) store in the neighborhood, I heard some loud unfamiliar-sounding birds squawking above. When I watched for the birds as I drove away from the store, I found them perched in the trees and on the rooftop of a nearby white stucco apartment building, just next to the OSH store. 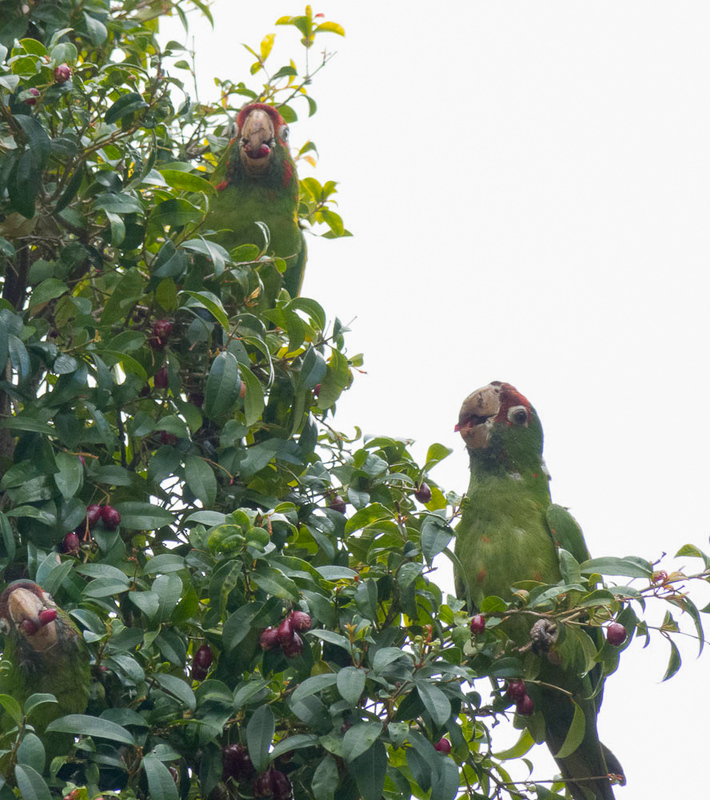 Bright green with splotches of red, with their distinctive beaks. Yes, these were parrots! Instantly recognizable and such an odd and wonderful sight. Over the years, I have continued to keep my eye out for the parrots. All you have to do is open your car window, turn down your “radio” and if they are in the area, you will know it. Very loud and from the sound of it, they always seem to be having some lively and spirited discussion among themselves. I have talked about them to friends and they are almost always surprised and find it remarkable, as I do, that these birds are out here and would survive in the wild. In searching the Internet, I have found a few short articles and postings that have been written in past years about these wild parrots. No one seems to know definitely where they came from, although there are stories and urban legends ̶ a local pet store closing, birds escaping from owners, but nobody seems to know for sure. So, where are the parrots? 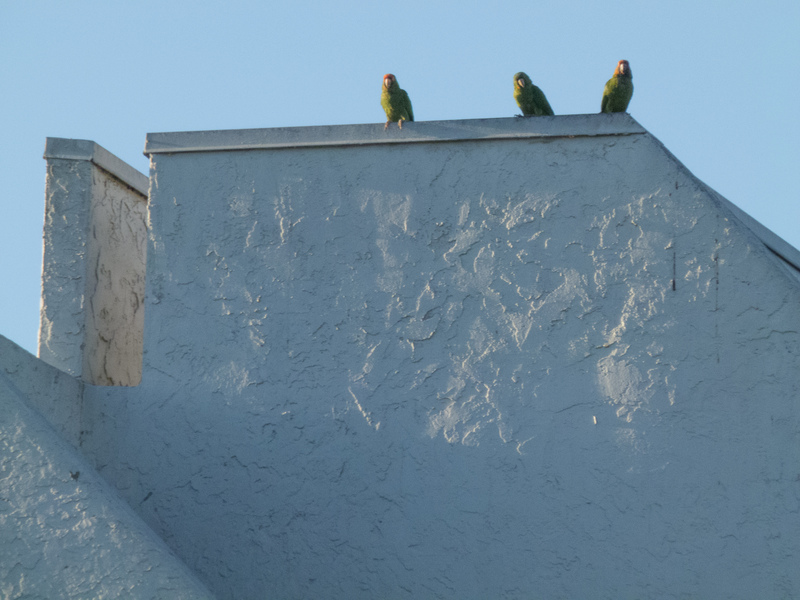 For those familiar with the area, the parrots appear to hang out most often in the area near El Camino Ave and Mathilda Ave, in Sunnyvale, where Matilda turns into Saratoga-Sunnyvale Road. 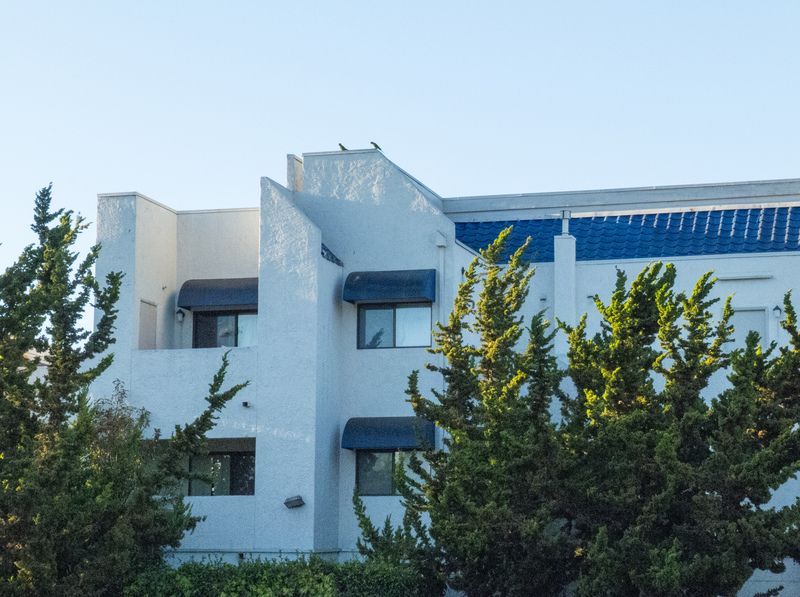 Depending on the weather and time of day, you can often see them perched on the blue-tiled roof on the white stucco Ville Cerise apartment complex at Talisman Drive and South Mathilda Ave or in the nearby trees next to OSH and across the street from a Toys-R-Us store. (There is also a new 24-Hour fitness club next to Toys-R-Us.) 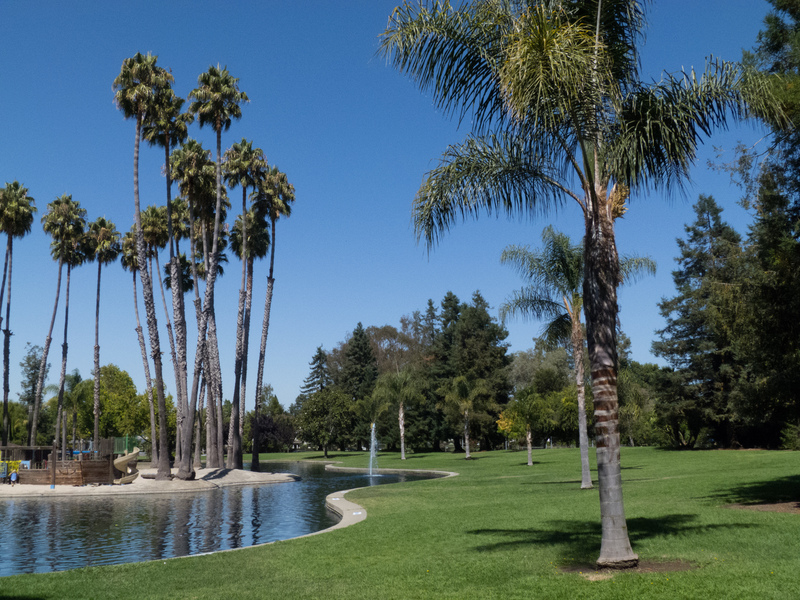 Some parts of this area were developed from the original Olson cherry and fruit orchards that once existed in Sunnyvale. This may also have been convenient in allowing the parrots to take a foothold, since they live primarily on a diet of fruits, seeds, and nuts. The parrots do get around a lot. Depending on the weather and time of day, I have seen them visiting neighborhoods as far as several miles away, as they forage for food, or perhaps simple entertainment. After all, what do you do all day, if you’re a parrot? 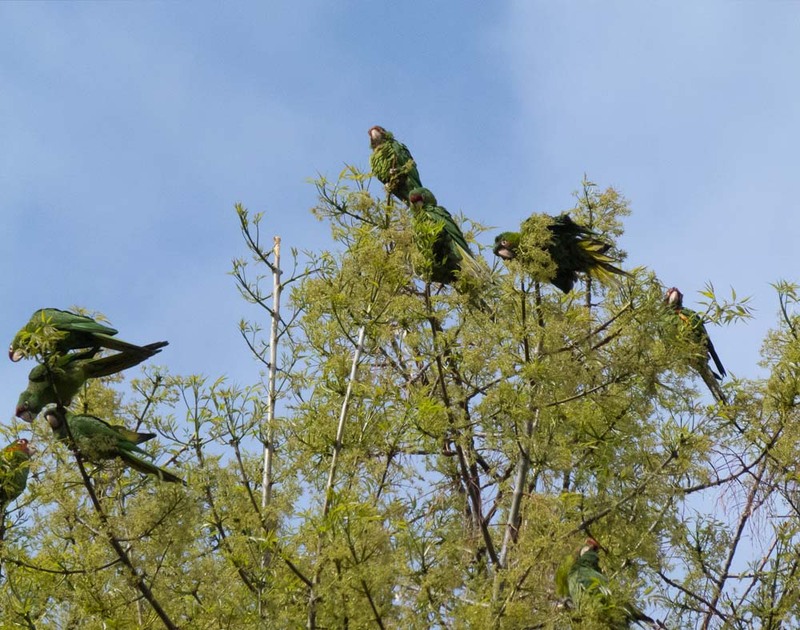 At various times and, particularly, towards the end of the day, they congregate in Los Palmas Park, just a few blocks from El Camino and Mathilda Ave. A cluster of palm trees in the park seems to provide a safe haven for the parrots to roost at night. In the late afternoon, different groups from the flock arrive and squabble about accommodations and sleeping arrangements, but then seem to quiet down once they’re all settled in. What type of parrots are they? 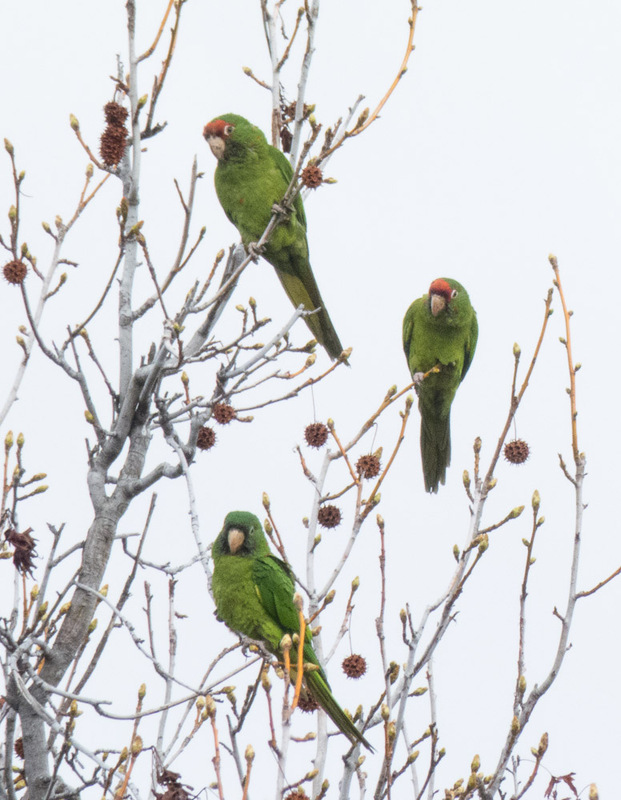 Sunnyvale Park officials I’ve spoken to, have indicated the parrots are mitred conures, aka red-headed or cherry-head conures. Adults are mostly green with varying amount of red around their face and throat, and are approximately 13 to 15 inches in length. 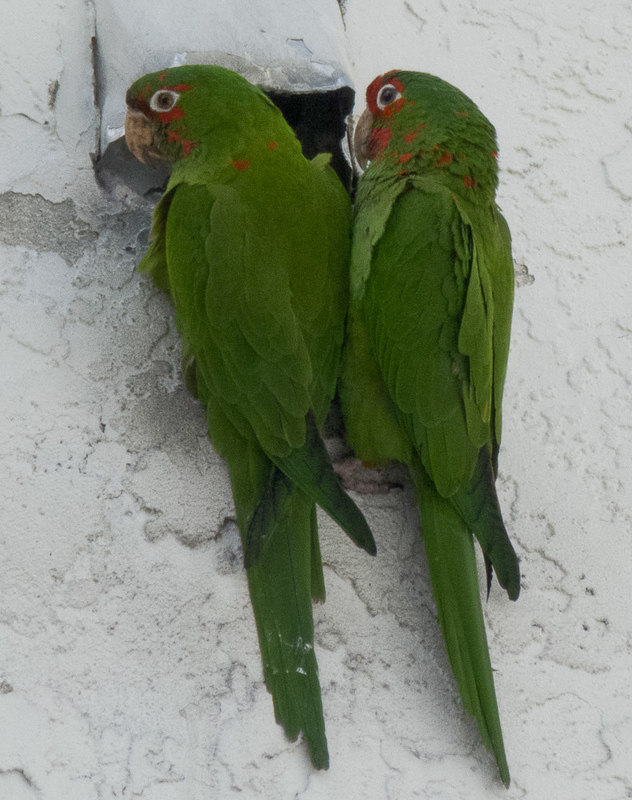 The mitred conures are native to South American countries, in particular, Peru and Argentina, but in the U.S., populations are also known to exist in states such as California and Florida.